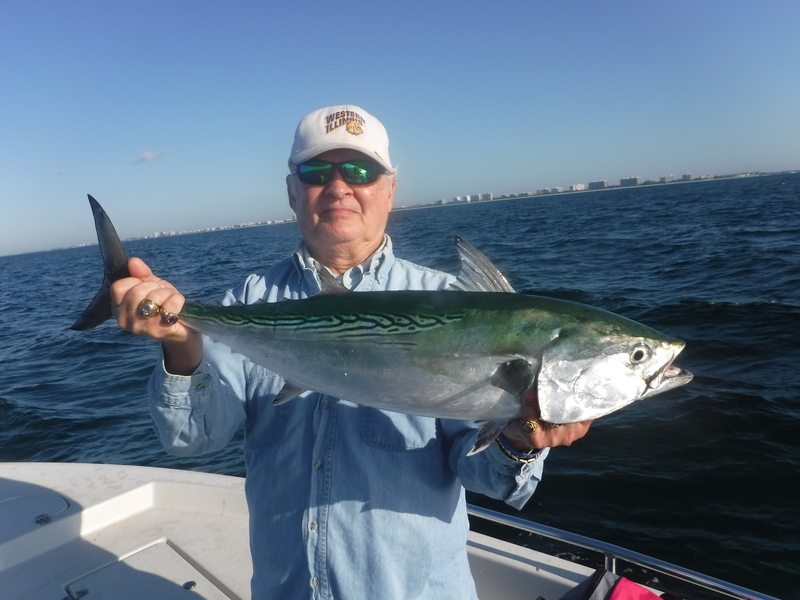 Capt Jim Klopfer offers a Siesta Key fishing charter to visiting anglers. Sarasota Bay has many different species that please clients. Novice and experienced anglers will have success using a variety of techniques. Tactics and target species change throughout the year. 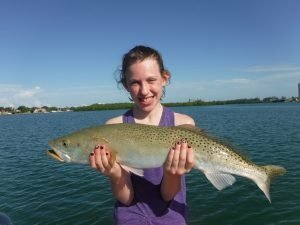 The key to angling success on a Siesta Key fishing charter is the willingness to adapt to changing conditions. Capt Jim offers several different options to take advantage of conditions. Inshore saltwater fishing is available all year long. Fishing the inshore Gulf of Mexico is productive in the spring and fall. River fishing charters produce big snook and jacks in the cooler months. Both live and artificial baits are used, depending on angling experience and season. An inshore charter on Sarasota Bay is the best option for most anglers visiting Siesta Key. There are many different species that can be targeted using different techniques, depending on conditions and time of year. Opportunities abound for anglers fishing Siesta Key on the west coast of Florida. Anglers can expect action and variety on a fishing charter. 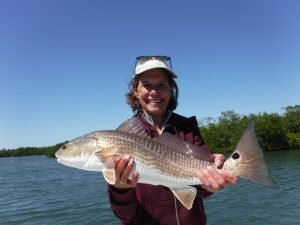 Redfish can be sight fished in shallow water, tarpon are targeted along the beaches, and snook will ambush prey along mangrove shorelines. But the majority of fish caught on my fishing charters are done so on the deep grass flats in Sarasota Bay. Many of my clients have very limited angling experience. In fact, some had never caught a fish before and we certainly fixed that! Fishing the deep grass offers those anglers the chance to catch a lot of fish. These same techniques will produce all along the Gulf Coast. 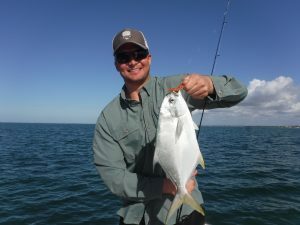 While the largest fish on the flats are typically found in quite shallow water, the deep grass flats will produce more in terms of variety on a Siesta Key fishing charter. Anglers who just want to bend the rod and perhaps catch a fish or two for dinner can’t do better than drifting the deep grass flats. Spanish mackerel, speckled and silver trout, pompano, bluefish, jack crevelle, mangrove snapper, gag grouper, black sea bass, flounder, cobia, ladyfish and even tarpon are all available at one time of year or another. Every once in a while a snook or redfish will be encountered over open flats deeper than four feet. Mottled expanses of grass in depths from four to eight feet will be the most productive. Wind, tide, and water clarity all play a role in choosing which flats to fish. The best situation is one in which the wind and tide are moving in the same direction. Generally speaking, incoming tides are preferred but as long as the water is moving, fish can be caught. Flats just inside a pass can be the best spots of all as they flood with bait and clean water from the Gulf of Mexico. Finding clean water is another element when fishing. The exception to this is right after a cold front passes through. Those flats will soon be covered with “dirty” water due to wind churning up the water in the Gulf. On breezy days it is easier to fish flats that are in protected water as opposed to those in open bays. Many inshore bays have a shallow bar that runs parallel to the shoreline. These bars generally have a sloping bottom with lush grass that drops off into deep water. These are great spots to fish! 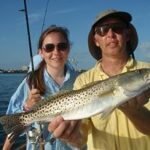 Speckled trout and pompano might be taken in the four to five foot depths while Spanish mackerel, bluefish, and ladyfish are usually found on the outer edges of the grass. Points usually have good grass flats on both sides and are also excellent spots to try. Areas near passes will have natural deep channels along with man-made dredged channels. Any grass flat that drops off sharply into deep water can hold fish, particularly on a low tide. Artificial lures are both very productive and a lot of fun to fish on a fishing charter. Casting lures out in front of a drifting boat is a great way to cover a lot of water efficiently. Begin the drift on the up-tide or up-wind side of the flat. Fan cast the area while varying the retrieve. Lures will produce action and variety. Pay attention to details such as depth and water clarity. If a drift produces good action, idle around and make another pass through the same area. If not, move on to another spot. This technique allows anglers to eliminate unproductive water fairly quickly. Occasionally, I will anchor when using lures. One recent charter comes to mind. It was very windy and Spanish mackerel were isolated on the up-tide side of grassy points with good current flow. The wind and tide made working these points difficult while drifting. I anchored a short distance away and had my clients cover the small flat using Rapala X-Raps. A fast, erratic retrieve triggered some very exciting strikes! We ended up with a dozen nice Spanish for the box along with speckled trout and ladyfish. The most popular artificial bait on the west coast of Florida is the lead head jig with a soft plastic body. These baits come in a myriad of colors and styles, but they all basically work the same. And they all catch fish. Bass Assassin jigs come in some great colors and sizes and are very cost-effective to fish. My personal favorite is the gold shad tail on a ¼ ounce white jig head. Grub tails and jerk baits are also effective. Dark colors such as olive, green, and rootbeer work well in dark water while gold, silver, and white are good choices in clear water. Chartuese is a great all-round choice and hot pink is a good option when the water is dirty. Scented soft plastic baits such as Gulp! can make a big difference on days when the fish are reluctant to bite. Plugs are also effective lures when fished over the deep grass. Suspending plugs such as the venerable MirrOlure are deadly on speckled trout. Both topwater and shallow diving plugs will also catch plenty of fish. The Rapala X-Rap slashbait is a great choice for working areas where fish are breaking on the surface. These lures dive a few feet down and have great action. A fast, erratic retrieve is usually very effective. One disadvantage in using plugs is that the multiple treble hooks can damage small trout. Silver and gold spoons have been around a long time and they still catch fish. 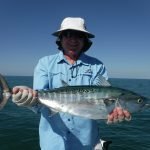 Spanish mackerel love a quickly retrieved silver spoon while speckled trout seem to prefer a slowly wobbling gold spoon. In open water spoons with a treble hook such as the Johnson Sprite are utilized; there is really no need for a weedless spoon in this application on a Siesta Key fishing charter. Fly fisherman can use the same tactics to score on the deep flats. Any fish that will hit a jig will take a weighted fly. The most popular pattern by far is the Clouser Deep Minnow. There are a ton of variations on this fly, but basically it is a hook with some dressing and a weighted eye that allows it to sink. The fly is cast out, allowed to settle for several seconds, and retrieved back in short strips. White, green/white, olive/white, and chartreuse/white Clousers tied on a #1 or #2 hook are the most popular flies. A 7or 8 weight rod with an intermediate sink-tip line works best. I use Orvis tackle. Many fly anglers make the mistake of using a floating line. Even with a weighted fly, the line will not get down deep enough when fishing in water over six feet. While artificial lures are productive, live bait is tough to beat. Shrimp and bait fish are the two most popular live baits. Shrimp are purchased locally while bait fish are usually caught, but they are sometimes available at bait shops. Pinfish, grunts, and “whitebait” are the most commonly used live bait fish. “Whitebait” is a generic term for any shiny white fish that schools up in large numbers (pilchards, threadfin herring, etc). Match the hook size to the size of the bait. A 1/0 live bait hook is a great all-round choice. I usually free line the bait, but sometimes either a split shot or a float will be required, depending on current flow and depth. Use a long shank hook if cut-offs from mackerel and bluefish become a problem. A well full of 3” pilchards practically guarantees success. These are caught with a cast net over shallow flats or out on the beach. In the summertime flats near the passes will be covered with these bait fish, especially on an incoming tide. If they are seen on the surface “dimpling”, it is easy enough to quietly ease into range by drifting or using a trolling motor. Chumming is a great way to get a bunch of baitfish within range of a cast net. A can of jack mackerel (purchased at your local Publix) and a half loaf of wheat bread is a proven mixture. Add just enough salt water to make a thick paste. Anchor in two to four feet of water on the up-tide side of a flat and sparingly toss pea-sized pieces into the water. The bait should show up within a few minutes. This will produce action and variety on fishing charters. I use the same tackle and rig with both live bait and artificial lures. A 6 ½ foot spinning rod with a matching reel spooled with ten pound monofilament line works well in both applications. A Spider Hitch is used to double the last three feet of line and a double Uni-Knot attaches a 24” piece of fluorocarbon shock leader. 30 lb test is a good all-round choice, but conditions will dictate what size leader to use. Clear water will perhaps require lighter leader while dirty water or the presence of toothy critters such as bluefish, mackerel, or sharks will make 40 lb or 50 lb leader a better choice. The lure or hook is then tied on to the end of the leader. I do not like to use snaps, swivels, or any other types of “hardware”. The exception to this is when using spoons. A snap swivel will eliminate line twist. Tackle and rigging are important aspects when fishing. Contrary to popular belief, January is winter, even in Florida, and it does get cold. In order to be successful fishing during cold weather, anglers need to adapt to the different conditions that are presented this time of year. First, let’s go through the weekly weather cycle. It begins after a cold front moves through. The wind will be out of the north east and it will be chilly in the morning. The next couple of days will be pleasant and sunny with east winds. As the next front approaches, the wind will shift south with clouds and a chance of rain before the front moves through and it blows hard out of the northwest. The best days are usually the ones with south winds, just before the front moves through and the pressure is just starting to drop. Tides are also a factor in cold weather. Morning tides can be extremely low, especially when coupled with a northeast wind. This will congregate fish in holes and deep channels, there simply is not enough water on the flats for fish to be comfortable. Holes in creeks and canals will produce sheepshead, redfish, snook, trout, drum, and flounder on the low tide stages. Afternoons will often be more productive as the day warms and the tide rises, especially for speckled trout. Both passes and the surrounding flats will be productive several days after a front passes as the water clears, fish do not like dirty water. The area from Stickney Pt. south to Blackburn Pt. is very reliable this time of year. It offers deep grass flats, oyster bars, bridges, creeks, and canals. Water quality is usually better as it is protected from dirty water that comes in for the Gulf of Mexico. Shrimp are extremely effective baits this time of year. Cold weather means lower water temperatures will result in fish being more lethargic. A live or freshly dead shrimp fished on the bottom with catch just about every species. Frozen shrimp are a good second choice. On lower tide stages, deeper areas will be more productive. Oyster bars that drop off sharply, deeper holes in creeks and canals, bridges, docks, and channel edges are all good spots to try. A #1 hook on a 2’ piece of 20 lb. leader with a split shot (if necessary) is all that is needed. If the action is slow, try chopping up a shrimp or two and tossing the pieces into the water, this may get the fish going. A live shrimp fished under a popping cork will catch a lot of speckled trout when fished over grass flats on a high tide. Artificial lures will also catch plenty of fish in cold weather. A jig/grub combo is perhaps the most popular and effective lure. 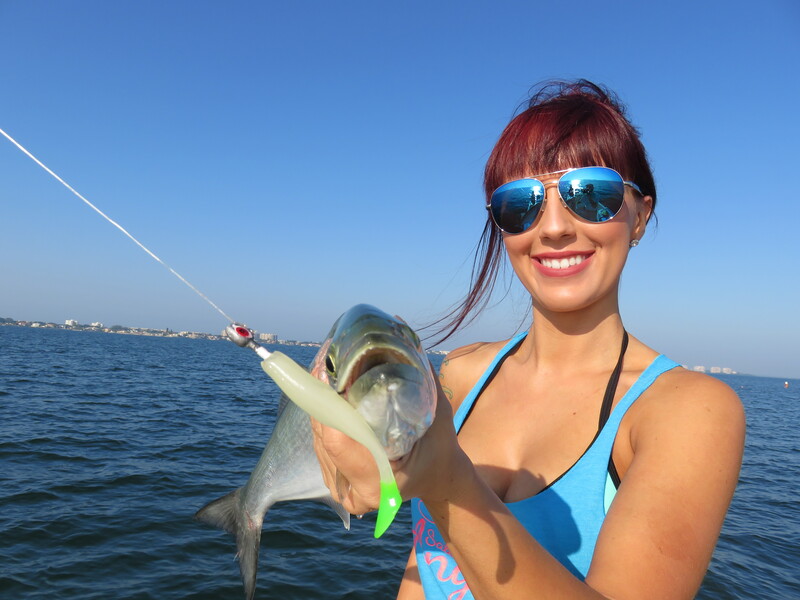 Bouncing a jig down channel edges and in both passes will produce pompano, trout, ladyfish, and other species. Again, in cold water a subtle retrieve will usually elicit more strikes. Sometimes tipping the jig (adding a tiny piece of shrimp) will make a big difference. Jigs will also fool speckled trout, pompano, and ladyfish on the deep grass flats. Darker colors such as olive and rootbeer are quite effective fished on a ¼ ounce jig head. Plugs are also effective winter baits. Suspending plugs such as the MirrOlure MirrOdine and 52 Series are deadly in cooler water. The lure is cast out, allowed to sing several seconds, and twitched sharply. The bait suspends there, seemingly helpless, triggering strikes. Snook and jack crevelle will migrate up into the many creeks and canals in our area. Shallow diving plugs are very productive lures, allowing anglers to cover a lot of water fairly quickly. Olive and gold are two very productive colors on a Siesta Key fishing charter. Take what Mother Nature gives you this month. Enjoy the warm, sunny days and fish the open flats. In cold weather, breezy days, don’t fight it. Find a protected spot to hide and soak a shrimp on the bottom. Plenty of fish can be caught. I had a charter last January that sticks in my mind. The weather was awful, northwest winds at 20 + knots. I never put the boat on plane and we caught a ton of fish! We started off in the Intracoastal, catching sheepshead on live shrimp. Then, we located a school of ladyfish in a deep hole in a canal and caught one on every cast on red/gold Bass Assassin jigs. 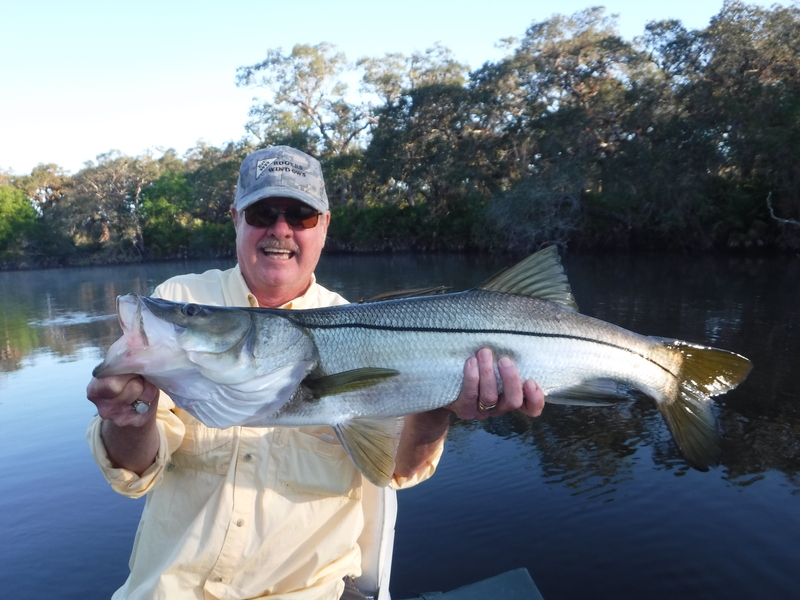 We finished up catching snook and jack crevelle on Rapala way up in Phillippi Creek. Be flexible and have fun this month while other less adventurous anglers stay at home. Fish love structure, it is an undeniable fact. It provides cover and attracts forage. All species of fish can be taken inshore structure fishing, but the primary targets will be sheepshead, snapper, flounder, gag grouper, redfish, snook, jack crevelle, and black drum. Sheepshead are very reliable in winter and early spring and they will often times bite when the water is cold and dirty and other species shut down. Mangrove snapper school up on the channel edges and bridges in the summer time. 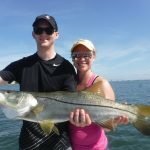 Snook, reds, and jacks are available all year. Inshore structure fishing takes many forms; bridges, docks, seawalls, rip-rap, rock piles, artificial reefs, oyster bars, and holes. Both Big Sarasota Pass and New Pass are filled with fish-holding structure as are most of the passes and inlets in Florida. Docks and oyster bars are abundant in our area, along with several bridges. The north end of Siesta Key in particular is a terrific spot with deep water and miles of rip-rap, docks, and the Siesta Drive Bridge. The following breaks down the two different techniques for fishing deep water and shallow water structure. In most instances, a vertical presentation is the most effective way to target fish in deeper water. A knocker rig works very well in this presentation. It is simply a sliding sinker that rests up against the hook. This results in the bait resting right on the bottom and allows a fish to move off with the bait without detecting any weight. A two foot piece of heavier leader helps prevent cut-offs on the sharp rocks. The baited hook is lowered and allowed to lie on the bottom with a taught line. As with all structure fishing, use as little weight as possible, just enough to hold the bottom. The best time to fish deeper areas is during periods of slow tidal movement as a lot of current makes fishing too difficult. Docks and bridge pilings in four to twelve feet of water make up the majority of structure in Sarasota waters. Anchoring several boat lengths up current and tossing the bait back towards the structure is the best approach when fishing these spots. Whenever possible, use a minimal rig consisting of a two foot piece of leader, a hook, and a split shot. If heavy current exists, use the “knocker rig” with a light weight. When the water in the passes is clean, docks adjacent to the passes will be productive. After a front moves through, the passes will be full of cold, dirty water. The area to the south is more protected and often times the docks and canals here will offer better fishing as most species prefer cleaner water. Do not overlook oyster bars as structure! Bars are plentiful from Stickney Pt. south to Blackburn Pt. Any bar that has a drop off into three or four feet of water may hold snook, reds, sheepshead, jack crevelle, and other species. Quietly approach the bar and anchor as far away as possible to avoid spooking fish. Free lining a live shrimp or pilchard with no weight is the most productive technique when fishing shallow bars. A low, incoming tide is normally the best time to target these fish-holding structures. Fish will stage in the deeper water waiting until the tide floods and they can get up on top of the bar. Once that occurs, they scatter out and are more difficult to locate. The coldest weather will send fish scampering into creeks and canals. The water will be warmer, which also attracts bait fish. Deep holes will hold fish, especially on the low tide stages. Holes and changes in depths are often overlooked by other anglers. Treat these spots just like and other structure, anchor up-current and let the bait flow back naturally either free-lined or with a split shot. For the most part, this is a natural bait situation. While artificial lures can be very effective, particularly around docks, the focus will be on anchoring and fishing with natural baits, which in most cases means live shrimp. Live shrimp are the most popular bait when fishing structure in the cooler months on. They are readily available, easy to keep alive, and are effective on a variety of species. Hook the shrimp just under the horn, allowing it to swim freely. If fish are nibbling around the hook, thread the shrimp onto the hook from the tail. Frozen shrimp are a suitable replacement if live shrimp are unavailable. Sand fleas and fiddler crabs are both effective live baits, but anglers will have to catch their own. Frozen baits are usually available at local bait shops. Squid and other frozen cut bait can be used successfully, especially for flounder and snapper. A 7 foot spinning outfit spooled with twelve to fifteen pound line is ideal for inshore structure fishing. The rod needs to be stout enough to pull a decent fish away from cover, yet light enough to cast a small bait and detect subtle strikes. A shock leader should be used. The water clarity will determine what size to use; thirty pound test leader is a good all-around choice. Hooks come in a variety of sizes and styles. Match the size of the hook to the baits that are being used. A #1 short shank hook will work well in most circumstances. Circle hooks are quite popular with many anglers and vastly reduce the number of fish that are hooked deep. Another popular option is a plain jig head, which basically is a hook and weight all in one package. As the water temperature approaches seventy degrees, live bait fish become extremely effective baits. Pinfish, grunts, and pilchards will fool snook, reds, flounder, and mangrove snapper. Pinfish and grunts can be purchased, shiners (pilchards, threadfins, etc.) will need to be cast netted by the angler. Bait schools are seen and cast over, or a mixture of jack mackerel and wheat bread can be used to lure the baitfish within range. A large livewell is required to keep these baits alive. Again, match the hook size to the baits, a larger 2/0 hook may be required. One common mistake many anglers make when inshore structure fishing is moving the bait too much, especially when the water is cooler. Allow the bait to sit still and when a fish begins to nibble, do not move the bait at all, wait until a good pull is felt, then raise the rod tip and reel. This works well with both circle hooks and “J” hooks. The judicious use of chum can spell the difference between a successful outing and a slow one, particularly when the water is cold or dirty. A couple of shrimp diced into small bits will often stimulate the fish, but too much chum will fill them up. Also, do not chum in heavy current, doing so will have the opposite effect, pulling fish away from the spot instead of attracting them. One morning in early spring I was out on a fishing charter with a family. We were targeting sheepshead under the docks that surround Bird Key. 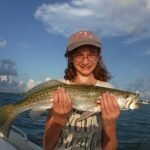 Michelle, a teenage angler from New York, cast her shrimp out and within several seconds her rod bowed deeply and the drag screamed as lined peeled off of the reel. She was almost pulled out of the boat! I quickly came to her aid, helping her pull the fish away from the dock. Miraculously, we were able to stop the fish just short of the pilings. Several more runs ensued, testing both the light ten pound tackle and the angler’s skill. We prevailed this time, landing a 22” gag grouper. You never know what surprise await inshore structure fishing Sarasota! Shorter days and cooling water temperatures announce the beginning of autumn here on the Suncoast. The changes are subtle, but they are there. A sweatshirt might be required on some mornings, along with long pants. The grass stops growing. The oppressive humidity is easing. It is one of my favorite times to fish in Florida! When conditions are right, I will be out in the inshore Gulf of Mexico chasing Spanish mackerel and false albacore enjoying a Siesta Key fall fishing frenzy. Spanish mackerel are a terrific and underrated gamefish. They strike lures, flies, and live bait with reckless abandon, make long runs, and are superb table fare. October is a prime month to target these speedsters both in the Gulf of Mexico and in Sarasota Bay. There will be plenty of mornings when the wind is out of the east and the Gulf is flat; these are excellent conditions to run the beach in search of outstanding light tackle action. Birds working on the surface are a certain sign that feeding fish are in the area. Several artificial reefs off of Lido Key are also reliable areas to fish. When schools of fish are seen feeding on the surface, a true Siesta Key fall fishing frenzy, I usually choose to cast artificial lures at them. My personal favorite is a Rapala X-Rap in the (08) size. Lighter colors work best in the clear water. Cast the plug out and rip it back in with an erratic retrieve, the faster the better. This will produce explosive strikes! Silver spoons, jigs, and flies are also quite effective. I will often times replace the treble hook(s) with a single long shank hook to allow a better release. On days when the fish do not “show” as well, blind casting or free lining live baits can produce. This is a great opportunity for anglers who are interested in a fly fishing charter. Larger mackerel will get into the backing. The best outfit is an eight weight with an intermediate sink tip line. A white D.T. Special tied on a long shank hook will catch plenty of fish and reduce cut-offs. An eight foot piece of fluorocarbon leader works well, but a section of 50 lb can be added should the sharp teeth of the macks become a problem. Fast retrieves work best. In fact, it is sometimes difficult to move the fly quickly enough. Keep the rod tip low, strip quickly, then “strip strike” the fish when it hits. This involves pulling sharply on the fly line with the stripping hand and smoothly raising the rod tip. Anglers who anchor up and chum on one of the inshore artificial reefs are virtually guaranteed to experience success in October. They can create their own Siesta Key fall fishing frenzy. The best approach is to anchor up-wind of the structure and free line a live bait back behind the boat. A long shank 1/0 hook and 30-40 lb leader works well. Use a split shot if wind or current do not allow the bait to sink. Chum is not always necessary but increases the odds. Frozen blocks of chum can be purchased at local shops. Live baitfish that are crippled and tossed out will bring the gamefish right up to the boat. False albacore (little tunny, bonita, fat Alberts, albies) will also be encountered in the inshore Gulf of Mexico. Albies are incredible sport though more challenging than the mackerel. They can be fussy and usually move faster and do not stay up as long. Patience will pay off. It is better to sit and wait for a good shot than run all over the place. Eventually they will pop up within casting range. The same lures that fool the macks will catch the tunny. Anglers should not be surprised if other gamefish crash the party. Sharks, king mackerel, cobia, and even tarpon will hit baits meant for smaller game. The albies and mackerel can be landed on fairly light tackle but the cobia, kings, and tarpon will require a step up to heavier gear, so bring along some beefier tackle, just in case. My Client cast the Rapala towards a submerged tree at first light on the mist-shrouded Myakka River. She began her retrieve, giving it sharp jerks and then pausing briefly, imitating a wounded baitfish. On the third pause, there was a huge boil as a nice snook inhaled the lure, violently breaking the eerie morning silence as at leapt high out of the water in an effort to toss the plug. Unsuccessful, it dove for the safety of the fallen tree. I used the trolling motor to put some distance between us and the structure. It was nip and tuck for a few moments, but Bonnie fought the fish like a pro, and eventually it came alongside the boat, posed for a quick photo, and was released back into the dark, tannin-stained water. I love river fishing! It is one of my favorite trips. River fishing has all of the elements that I enjoy most when angling; serenity, solitude, great scenery, and the chance to catch large fish on artificial lures using fairly light tackle. It simply does not get any better than that! Rivers offer several advantages over open bays and other large bodies of water. Most importantly, the fish are easier to locate; there is simply less area to search. Rivers also offer protection from the wind on days that it is blowing hard. In the cooler months, snook migrate up into rivers to escape the drastic temperature changes that can occur on the shallow flats. Snook are an “amphidromous” species, meaning they can tolerate absolute fresh water, but their migrations are not for the purpose of spawning. Both coasts in the southern half of Florida offer many opportunities to experience this type of fishing for snook. Tarpon, largemouth bass, gar, and other species will also be encountered; the types of available species will depend on the season, location, and salinity level of the river or creek that is being fished. I use artificial lures when working rivers and shallow diving plugs have proven to be very reliable. They have several advantages over other types of baits; anglers can cover a lot of water, these plugs are relatively snag-free, and the hook-up ratio is high due to the multiple treble hooks. In the dark tannin stained waters that I fish on the west coast, gold and Firetiger are the two most productive colors. In clearer water, chrome and white work well. #10 Rapala X-Raps and BX Minnow baits in gold and Firetiger are my go-to baits. The new Rapala Jointed BX Minnow has fantastic action and is a good choice as well. Topwater baits will catch fish early and late in the day as well as under overcast conditions. Lipless crankbaits such as the Rat-L-Trap will produce and are a good choice for anglers with less experience as they have a lot of built-in action. For whatever reason, they also tend to catch more bass. The best technique when using suspending or shallow diving baits is an erratic retrieve with pauses in between. Often times the snook or bass will crush the lure as it hangs there motionless, seemingly helpless. The Jointed BX Minnow has a lot of built-in action and will produce fish with a slow, steady retrieve. Same goes for the lipless crankbaits. As with all artificial lure fishing, vary the retrieve until a productive pattern emerges. Soft plastic baits can also be extremely effective, particularly when the water gets cold and the fish are a bit inactive and do not want to chase a faster moving lure. Low water conditions will tend to concentrate fish in the deeper holes; this is another good time to slowly work a soft plastic lure. Weighted swimbait hooks work very well and will snag less that a jig and grub combination will. Swimbaits such as the Bass Assassin Boss Shiner in darker colors are my favorite baits. These lures have a broad tail that gives it a seductive action. The bait is cast out, allowed to sink, and brought back to the boat using a slow, steady retrieve. Unlike with the plugs, snook seem to prefer a more subtle presentation with the soft plastic baits. Spinnerbaits are another effective lure that allows an angler to cover a lot of water in a relatively short amount of time. They are very easy to use; a steady retrieve usually works best. Most freshwater spinnerbaits have a skirt. I have found that those made specifically for saltwater and have a jig and grub produce better in rivers. The Terminator Redfish Spinner is a good example of this. The strong, single hook is relatively snagless, has a good hook-up ratio, and makes releasing fish easier than a plug with treble hooks does. Gold blades and dark grub tails work well in darker tannin water. Both spin and baitcasting tackle works fine, use 40 LB braid and a 2’ piece of 40 LB fluorocarbon leader. 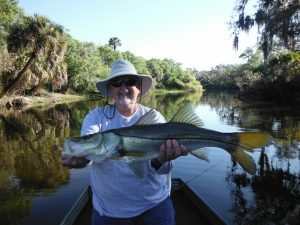 Fly anglers can score when targeting snook in rivers as well. In fact, it is a good opportunity to land a trophy fish on fly. A 9wt rod with an intermediate sinking line, and a 6’ piece of 40lb fluorocarbon leader is a good combination. Long casts are not required but stout tackle will be needed to land a big fish in the close confines of a river. Bright Clouser Minnow and Enrico Puglisi patterns that mimic a bluegill or tilapia produce well. White has also proven to be a good color for snook. Anglers will need to pay attention to their back casts in tighter sections. While fish may be found anywhere in the river, certain spots will prove to be reliable over time. In most rivers the outside bends, particularly if cover such as fallen timber is present, will prove to hold fish on a consistent basis. The current flow tends to gouge out a deep hole in the bends of the river. Also, while most structure is visible, a depth finder can be a valuable tool to locate fish. Florida rivers tend to “undulate”. A stretch of river bank may look identical, but the shallow spots will not be as productive as those that have a little depth. In fact, the drop-offs in the middle of the river act as current breaks and ambush spots and will hold predators as well. Rivers that have a lot of twists and turns are more productive than those with long, straight stretches. Trolling is both a great way to learn a river as well as to locate and catch fish on a river charter! Years ago Buck Perry invented the Spoonplug and it continues to be effective to this day. Lipless crankbaits such as the Rattletrap also work well, but I like to use diving plugs for one simple reason; they float at rest. If for some reason the boat needs to be stopped, these plug will float to the surface instead of sinking to the bottom. Trolling in rivers is quite simple; tie on a lure, let it out behind the boat, and drive up or down river at idle speed or just above. Once fish are located, slow down and fish that stretch thoroughly. Give a nearby river trip a try. Chances are you will enjoy change of pace and tranquility that river fishing offers. In most cases it is not a numbers game, but the challenge of catching a trophy fish in a peaceful setting may hook you, just as it has for me! Q: Do visitors to Siesta Key need a fishing license? A: Anglers going out on a fishing charter do not need to purchase a fishing license. The state of Florida has a provision where charter boat captains can purchase one license that covers all guests. However, anglers from out of state who want to fish on their own will need to obtain a fishing license. HERE is a link to the FWC site which has all fishing license requirements and the ability to purchase online. Q: What do anglers need to bring on a Siesta Key fishing charter? A: Clients taking out a fishing charter need only bring their drinks and snacks, appropriate clothing, hats, sunglasses, and sun screen. Fishing tackle, bait, licenses, and a cooler with ice are all provided as part of the cost of the trip. Anglers may bring along their own “favorite” fishing rod if they so desire. The same goes for clients who would like to fly fish. Capt Jim provides Orvis tackle, but anglers may bring their own equipment. Q: What fish species can clients on a Siesta Key fishing charter expect to catch? A: Siesta Key and Sarasota offer visiting anglers many different species that they may catch on a fishing charter. Speckled trout, snook, Spanish mackerel, bluefish, pompano, sheepshead, snapper, grouper, ladyfish, redfish, jack crevelle, flounder, cobia, bonita, sharks, catfish, and more are landed regularly. Capt JIm Klopfer’s personal best was nineteen species on one six hour charter! Generally, six to eight species are taken. HERE is a link to Capt Jim’s monthly fishing forecast. 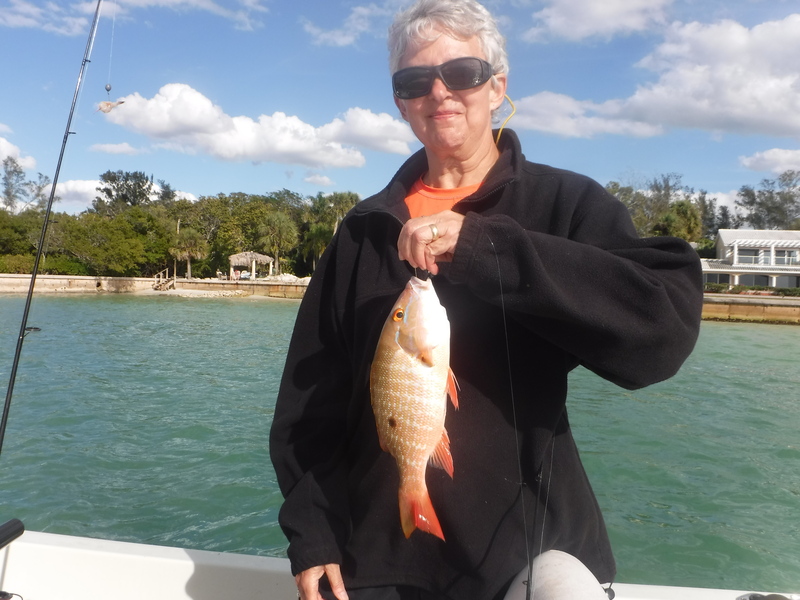 Q: Can fisherman keep fish to eat on a Siesta Key fishing charter? A: Yes. While Capt Jim promotes “catch and release”, he understands that many anglers enjoy a fresh fish dinner. Clients may keep a few fish, enough for a meal. Fish will be filleted and bagged for clients at the end of the charter. It will be stressed, however, that only a few fish for a meal will be kept. Sarasota Bay gets a lot of pressure, fish conservation practises need to be employed. Q: Where will clients meet for a Siesta Key fishing charter and what time? A: Capt Jim likes to pick clients up at the boat ramp in downtown Sarasota at Centennial Park. HERE is a link with the address and a map. 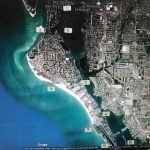 The back-up spot is Bay Island Park at the north end of Siesta Key. HERE is a link with the address. Time will be determined depending on weather, tides, and conditions. Morning is generally the best time to fish, though afternoons can be better in the winter. Q: What is the age limit for a Siesta Key fishing charter and how many anglers can be on the boat? A: There basically is not one. It is up to the parents to determine if their children are going to be relaxed enough and enjoy the experience. Capt Jim has taken many four and five year old kids out with great success! Four anglers is really the maximum that can fish comfortably. On occassion, Capt Jim will take out five if there are kids involved, with the understanding that only four will fish and the adults will help with the kids. Families with kids make up the majority of crews going out on charters and Capt Jim enjoys teaching the youngsters to fish. Q: How much does a Siesta Key fishing charter cost and what does it include? A: A four hour fishing charter is $400. Four hours is plenty of time for most anglers. The price includes the boat, Capt Jim and his experience and service, all bait, tackle, licenses. Longer charters can be arranged. A six hour fishing charter is $550. This is a better choice for more experienced fishermen. It offers the chance to do more challenging and time consuming fishing. 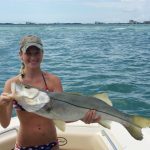 Anglers can target snook in the back country, bonita out on the beach, or just fish a couple extra hours.